JOTMAN: Has the Egyptian Revolution only just begun? Has the Egyptian Revolution only just begun? Activists in Cairo's Tahrir Square attach a banner listing the demands of the Youth Movement. I have not been in Cairo 48 hours, but it feels like a week-- or two. I spoke with the several of revolution's young leaders (there are many leaders). One gets the impression the Egyptian revolution has been led by the country's 'best and brightest.' Out in the square I met employees of Oracle and other big companies, Bank of Egypt, the Dept. Foreign Affairs, also physicians, and any number of university students. Such similarities to the Beijing movement of 1989 are apparent. As in Beijing, I'm told that in Cairo other social classes came out later. Today, people of all social classes mix in Tahir square. For example, in my Tahrir tent the other night, there was an aircraft mechanic, an unemployed ceramics artisan, a pharmacist, and a bank employee. As a fellow occupant of my tent put it, "We're all friends in here, yet we're all complete strangers!" Some sleep at Tahrir, going to work in the mornings. Tahrir Square is occupied territory of the Youth Movement, and the army keeps its distance. Needless to say, there is no uniformed police presence. I'm told that there are no (visible) police in Cairo, and the neighborhoods are self-policed. There is a curfew from 12pm to 6am, nominally enforced by the army. Among activists, there is debate about whether having some police return to the streets would be desirable or not. P, a demonstrator told me, "In the West, the police are called 'civil servants.' In Egypt police are called 'masters.' Over the years, normal Egyptian people have been pulverized by the police." P told me that before coming out to demonstrate on Jan 25, his mother warned him that if was caught by the police he would likely be raped. Public opinion of the army remains favorable, but the students want to army leadership to transfer power to a joint civilian-military led interim government. I photographed several activists putting up a large banner, listing the demands of their group. I asked P to translate the main points. "There have been many such banners, pictures of them are everywhere on Facebook. I have my own list, of course. I'll tell you how how the points on this poster compare." Seeming quite satisfied with the priorities outlined on poster, P proceeded to describe the four main demands of demonstrators. 1. A Presidential Council established consisting of two civilians and one representative of the military. 2. The current cabinet, having been established by Mubarak, has to go. In particular, the protesters can't tolerate the presence of Prime Minister Ahmed Schafik. The Minister of Justice and the Minister of the Interior also have to go. 3. The Emergency Law dating back to the beginning of the Mubarak era, has to be lifted. P said, "Mohammed Hassanain Heikal, an intellectual, summed it up nicely: 'we're not dealing with the corruption of a state, but a state of corruption." 4. Political prisoners have to be freed. When I asked how many there were, P. replied, "We don't know." P regarded the authors of the original Facebook page, particularly Wael Ghonim, the Egyptian Google employee who spent a week in jail -- he's married to an American -- as one person at the front of the movement. P and all the activists I spoke with were quick to say nobody is in charge. Last night, on a Cairo street, a man approached me. He wanted me to know that he condemned Obama for his slow support for the ouster of Mubarak, before proceeding to castigate the country for its other sins. Obama wages "war." America wants "petroleum." The man added, the expression on his face contorted into one of disgust: "Britannia same as America!" Before walking off he said, "Egypt is a country of peace." I didn't mention Egypt's costly military intervention in Yemen throughout the 1960s or the 1973 Arab-Israeli War, but had he stuck around, I might have brought these up. An employee of an American company told me that America had better realize "that Egyptians know its game, and the game is up." His tone was severe. Respect for the army as an institution remains high. For example, even activists seem to respect that soldiers have a right not to have their picture taken when at their posts. There's a propaganda war happening as to who owns the revolution. 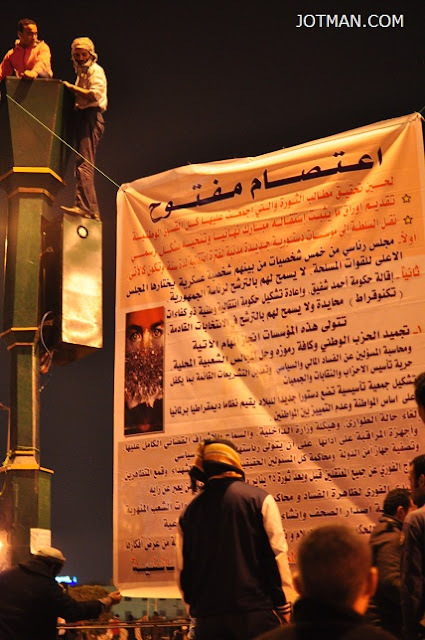 I was told the Egyptian press wasn't covering the ongoing vigil at Tahrir Square. There is speculation on the square that a coup within the army leadership is the people's' best hope for a successful transition to democracy. I don't know why anyone would be optimistic that this might happen, but two guys I spoke with seemed to think this a very real possibility. 1. The army is running the state, but for the time being at least, "the people" remain the force to be reckoned with in the new Egypt. 2. In meetings with the generals, representatives of the Youth Movement have demanded that their main points -- most important of which is the resignation of the prime minister and the appointment of a new cabinet -- occur by their deadline, which is tomorrow.